The Gigantic Fairy was born a giant in Gigantic Paradise. 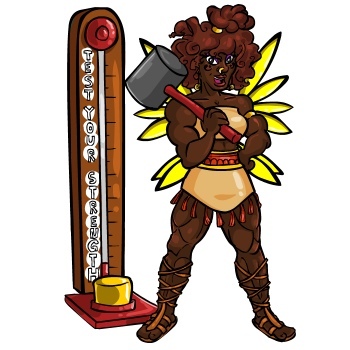 She was bullied as a child because she was always bigger than the other fairies, so she decided to work out at the Gym every day until she was the strongest fairy. You can visit her once every 3 hours to test your strength! The game is FREE to play. The Gigantic Fairy admires others who are strong like her, and encourages you to go the Gym to get strong. Take the mallet and hit as hard as you can! The stronger you are, the more you will be rewarded!